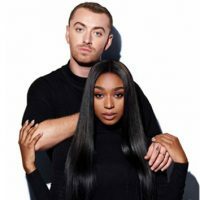 Steve SchofieldAs promised, Sam Smith‘s new single “Dancing with a Stranger,” featuring Normani, dropped just after midnight today. The sultry dance track features Sam and Normani trading verses that make it clear they’re former lovers who aren’t quite over each other yet, and seek comfort in the arms of someone else. “Dancing with a Stranger” is available for download now from the usual digital outlets. Look for a video soon as well. You can also order “Dancing with a Stranger” on vinyl, as well as other merch, on Sam’s official web store.